Well, we are just about there. Apparently time has been flying by for everyone, except me. Ha! I guess that’s pretty normal for a pregnancy. This week I’m 33 weeks pregnant (34 weeks on Friday) and we are counting down to our baby’s birth! This little girl officially has a c-section date for December 18th, which just happens to be the same birthday as my first daughter. It’s CRAZY that it worked out this way, but their due dates were only a couple days apart. As of right now my first kiddo says she’s pretty excited to share a birthday, but I have a feeling that will change when she’s about 14 or 15. As of right now I feel mentally ready for this baby. I’m done being pregnant (even though this baby needs to cook a bit longer) and I’m excited to meet this little girl. Her teeny tiny room is almost finished (so close), we’ve had her name picked out for months, and we are trying to clean our house like crazy in preparation. In addition to all that, I’m also trying to prep myself for the changes that a newborn can bring: no sleep, all the baby crying, possible issues with breastfeeding, and making time to eat a good meal. Below are some things I’ve been practicing and getting prepared to do. Be patient: It’s normal for a baby’s sleep pattern to be unpredictable. My first daughter’s sleep pattern was nuts and we didn’t really get a full night sleep until she was about 10 months old. I need to find patience (even when I’m too exhausted and tired) while her biological clock develops and begins to regulate. Use light and dark cues to foster the development of the circadian rhythm: Keep the baby’s sleep environment dark during times we want her to sleep. When she’s awake, expose her to natural light. Create an optimal sleep environment: provide a cool sleeping space (around 65 degrees Fahrenheit), keep the room dark, and keep the space quiet (maybe using a white noise machine). Make sure baby is eating most of her calories during the day: Encourage daytime feeding sessions, and help your baby wake to eat during the day by exposing her to natural light, opening up the neck of her pajamas or rubbing the bottom of her feet. Take a shower before bed: Warm water can help relax the body to help you fall asleep faster. This will also help that forgetting to shower problem I’ll have when I have a newborn, ha! Seek out a support network: Reach out to other moms and family members (and my Nutrimom coach that has also been through this). Get outside: It’s good for you to leave the house and breath in that fresh air (and get some vitamin D) and exercise is always a good idea. Remember to eat and drink: Like I mention below, I need to remember to eat some healthy food. Eating well and staying hydrated is key to feeling better during periods of less than optimal sleep. Become a nap person: this will be hard for me. Even when I’m super tired, I have a hard time napping. My brain just races with things I need to do, or want to do. I shouldn’t feel guilty about what I’m not getting done and worry more about taking care of myself. Sleep when the baby is sleeping. I also need to be sure I’m asking friends and family for babysitting help so I can get some extra sleep while they take care of baby. Practice deep breathing: If I just can’t fall asleep, deep breathing with my eyes closed, can help relax my mind. This could be a nice break. Caffeine: I’ll be honest, I do rely on the magic of caffeine. Before I was pregnant I was drinking a lot of coffee and black tea. I love it and I know I’ll be jumping right back in after this girl is here, but I need to make sure I don’t go too crazy. 4 shots of espresso a day (and past 3 PM) may just make me too jittery and crazy, then I won’t sleep at night. When my first daughter was born I lost all the weight I had gained REALLY fast, but not in a healthy way. I was deep into postpartum depression, lacking in sleep, and not eating. I just didn’t think to eat. I’d barely snack all day, then devour my dinner. I may have lost all of that weight fast, but I didn’t feel healthy. One plan we have to eat healthy is to prepare food ahead of time and store it in the freezer. We have a crock pot and all that goodness, so this plan should work great! I found a bunch of healthy crock pot recipes online. Since I’m getting some Personal Coaching, from Nutrimom, I was also sent some great freezer recipe ideas. 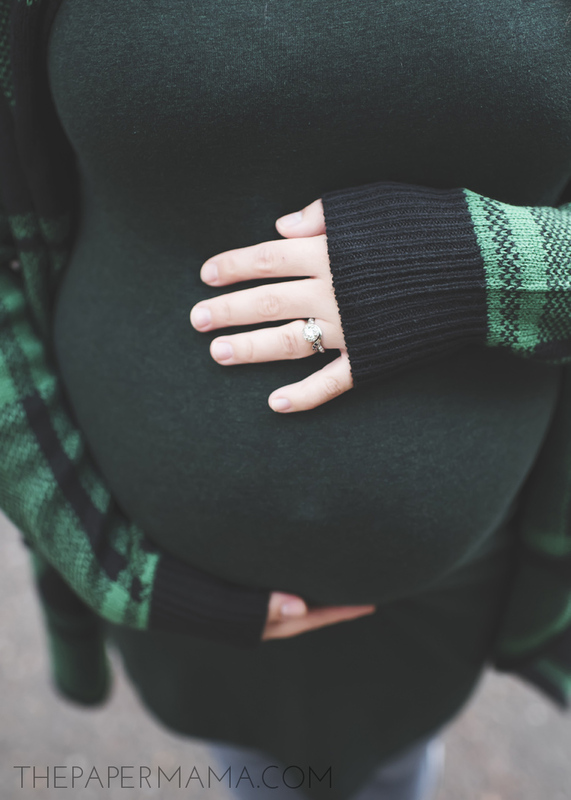 Are you getting SUPER close to your baby’s birth? Maybe it’s time to create a paper chain countdown for those final days to baby. We have a bit of a weird situation over here with my c-section date being scheduled the SAME day as my first daughter’s birthday, so I made my countdown a “birthday & baby” chain. 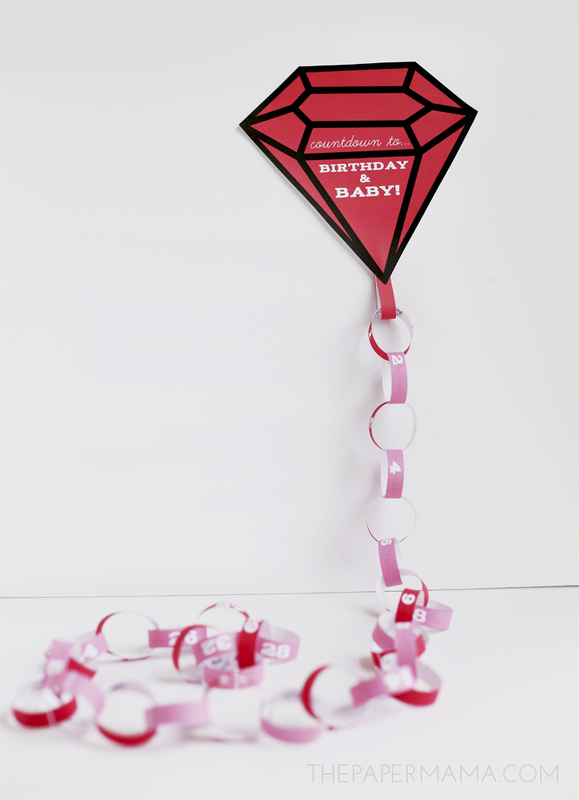 The free printables I provided for you have a “baby” diamond, and a “birthday” diamond to choose from (in three different colors: pink, green, and blue). The chain is easy to assemble. Just print out the numbers and diamond onto white cardstock paper, then cut them out. If you’d like, you can add a fun idea to the inside of each chain for your child to do (or for yourself). I shared a few of my ideas below. After you write all the ideas inside the chain, use the hot glue to adhere the yellow portion of the strip to the back of the other end, and continue gluing until you have the chain. Glue #1 to a loop on the diamond and have fun! 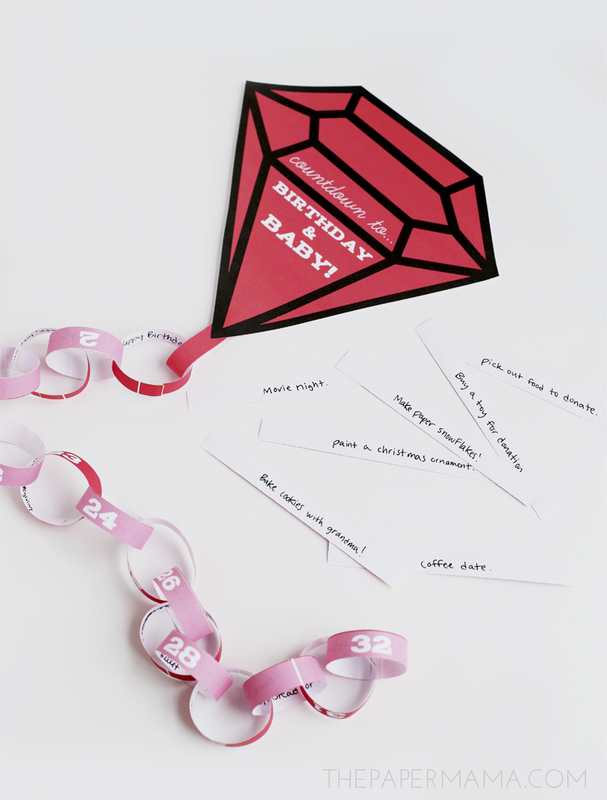 Download the baby (and birthday) countdown printables right here: pink, green, and blue. 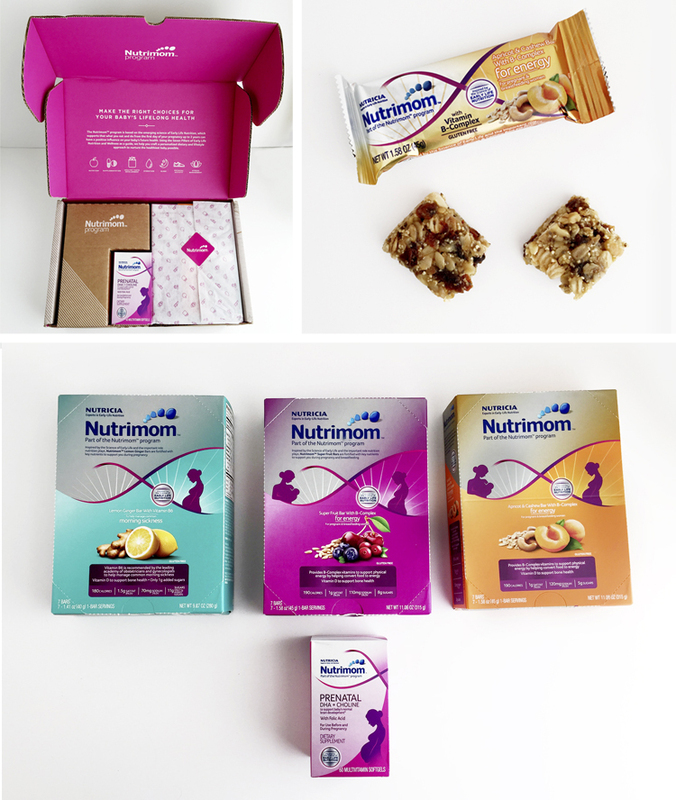 Be sure to check out Nutrimom on Instagram to get healthy (and tasty) recipe ideas and other bits of pregnancy knowledge. I’ll try and get back here soon with one more pregnancy update before baby gets here, but if I’m not…. get ready for some cute baby photos in about 4 weeks! You can keep up to date with my pregnancy (and upcoming birth) on Instagram, @thepapermama.